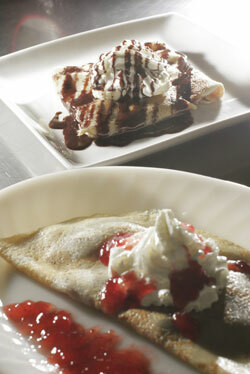 Either sweet or savory, crepes are the perfect gift for Mother's Day. As Mother's Day approaches (it's Sunday, in case you forgot), some advice from a mom: "You have to learn how to cook or your husband will leave you." OK, so it's advice that's frozen in time, space and attitude, but it sunk in with Rosario Tarvyd. "My sisters and I are very domesticated." They all learned to cook from their mother in the Philippines, then Rosario married an American, Chris Tarvyd, and moved to Hawaii. And she cooks, but then, so does he. In fact, they're cooking together in the semiprofessional ranks, in a traveling show called Crepes No Ka 'Oi. On weekends, they load up a truck with propane-fueled crepe makers and other supplies and head for a fair or festival to dish up crepes-to-go. Rosario and Chris Tarvyd created Crepes No Ka 'Oi as a weekend side business. They take their crepe-makers to festivals all over Oahu. This brings us to the matter at hand: Mother's Day, when fathers, daughters, sons and grandkids are legally obligated to do something special for the lady of the house. Crepes are a good idea -- a bit more complicated than pancakes, which shows you've put some effort into the matter. Plus they're pretty, befitting a holiday. And they can be served as breakfast for early-rising moms, or made into a savory lunch dish for those who are sleeping in. "A crepe is very versatile, so anything you want to put in it -- chicken, beef, spinach, mushrooms, onions -- those are all possibilities," Rosario says. She and Chris agreed to serve as guides to the crepe, simplifying their recipe and offering some easy fillings that kids can handle. Peanut butter's great, they say, with chocolate syrup squeezed out of a plastic bottle. Not to mention simple fruit preserves straight from the jar. Folded into a golden crepe and topped with whipped cream -- you've got a special-event dish. "My mom, she'd crank out 20 of these," Chris says. "Once you get the rhythm, it's easy." Neither of the Tarvyds is sure which of them came up with the idea of crepes when they were casting about for a food-related business they could pursue on weekends. "I love crepes, she loves crepes. Our first date was at a creperia," Chris says. So they bought a professional-quality crepe-maker that Chris set up in their living room. He worked on his recipe and technique, and last September they signed on for their first event, the Windward Hoolaulea. 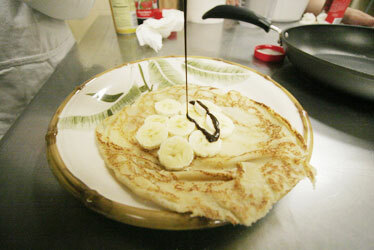 From 9 a.m. to 9 p.m. they cranked out 1,600 crepes. Since then, they've done 20 events while holding onto their day jobs -- he works for the Navy at Pearl Harbor; she's in the rental program office at the Ala Moana Hotel. Their six-month plan is to open a restaurant offering 50 types of crepes. In the meantime, fold up a crepe yourself. Or take Mom out for one. Crepes No Ka 'Oi will be at the Filipino Festival, 10 a.m. to 6:30 p.m. Saturday at Kapiolani Park. 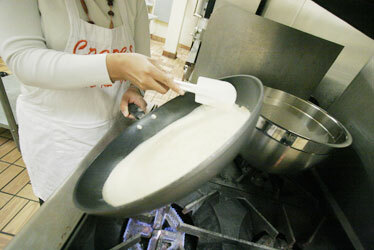 The first crepe of every batch is usually a throw-away. It tears or doesn't cook evenly. This happens even to the pros, say Chris and Rosario Tarvyd of Crepes No Ka 'Oi. So don't be discouraged. Move on. Their best advice is to use a good nonstick skillet, or well-seasoned cast-iron skillet. The only tricky part is learning to turn the crepe, but once you've mastered that, the project is simple enough for kids. If your aim is a Mother's Day surprise and you've never done this before, a little practice before Sunday may be in order. Crepes can be made ahead, stacked between waxed paper and frozen -- or you can save extra batter in the refrigerator so you can cook them up fresh. Give the batter a good stir and let it sit out to take the chill off before cooking. 1. Combine batter ingredients until smooth. Coat a 10- or 12-inch nonstick skillet with vegetable oil spray, then wipe the skillet so it's evenly and lightly coated. If the skillet is too oily, the crepe will get bubbly. 2. Pour about 1/4 cup of batter into skillet and turn skillet so batter makes a thin, even coat. 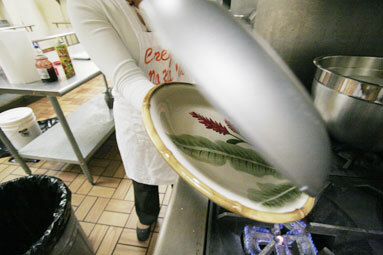 Stove should be set to medium-high heat; lift skillet occasionally if it seems to be cooking too fast. 3. Use a spatula (preferably heat-proof silicone) to loosen edges. It's ready to turn when the edges are dry and the bottom is golden. This will only take a minute or two. 4. 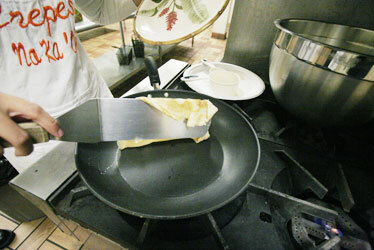 Lift and turn the crepe with a large metal spatula, or flip the crepe over onto a plate. 5. Lift crepe with spatula, allowing it to drape over side of spatula. 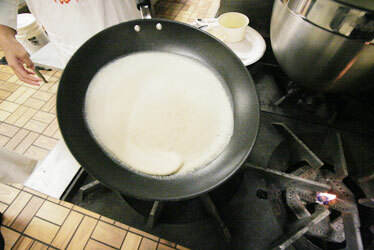 Gently return the crepe to the skillet, uncooked side down. When the underside is golden, lift it from the skillet, or flip it onto a plate. 6. Fill with sliced fruit and drizzle with chocolate, spread with fruit jam or add other fillings as desired. 7. 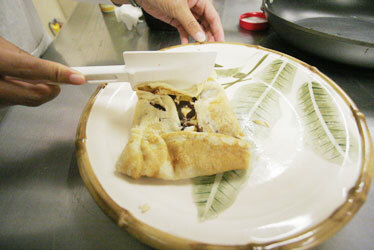 Fold edges of crepe to cover filling, then turn over. Top with more syrup and/or whipped cream. Sift flour and salt into mixing bowl. Create a well in center and add eggs. Slowly add half the milk, stirring constantly. Add butter and vanilla. Beat until smooth, while adding remaining milk. Cover and let sit 20 minutes or more. Spray 10- to 12-inch nonstick skillet with cooking spray and place over medium-high heat. Pour 1/4 cup batter into skillet and tip from side to side until batter covers bottom of pan. Turn when bottom is golden brown. Transfer to plate. Spread with filling. Fold. Serve warm. Makes about 12 crepes. Approximate nutritional information, per crepe, without fillings: 80 calories, 4 g total fat, 1.5 g saturated fat, 50 mg cholesterol, 50 mg sodium, 9 g carbohydrate, no fiber, 1 g sugar, 3 g protein.